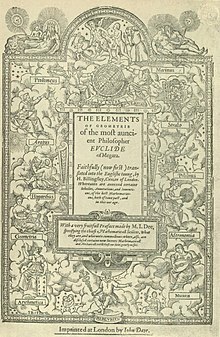 Sir Henry Billingsley's first English version of Euclid's Elements, 1570. Euclid's Elements (Ancient Greek: Στοιχεῖα Stoicheia) is a mathematical and geometric treatise consisting of 13 books written by the ancient Greek mathematician Euclid in Alexandria c. 300 BC. It is a collection of definitions, postulates (axioms), propositions (theorems and constructions), and mathematical proofs of the propositions. The thirteen books cover Euclidean geometry and the ancient Greek version of elementary number theory. The work also includes an algebraic system that has become known as geometric algebra, which is powerful enough to solve many algebraic problems. Unless otherwise noted, as translated by Thomas Little Heath, The Thirteen Books of Euclid's Elements (1908) Vol. 1 Intro, Bks 1-2, Vol. 2, Bks 3-9, Vol. 3, Bks 10-13, Appndx. Book I, Common Notions 5. Book I, Postulate 5 (The Parallel postulate). In right angled triangles the square on the side subtending the right angle is equal to the squares on the sides containing the right angle. Book I, Proposition 47 (The Pythagorean theorem). If a straight line [AB] be bisected and a straight line [BD] be added to it in a straight line, the rectangle contained by the whole [AD]... and the added straight line [BD] together with the square on the half [CB] is equal to the square on the straight line [CD] made up of the half and the added straight line. For let a straight line AB be bisected at the point C, and let a straight line BD be added to it in a straight line; I say that the rectangle contained by AD, DB together with the square on CB is equal to the square on CD. through the point B let BG be drawn parallel to either EC or DF, through the point H let KM be drawn parallel to either AB or EF, and further through A let AK be drawn parallel to either CL or DM. Then, since AC is equal to CB, AL is also equal to CH. But CH is equal to HF. Therefore AL is also equal to HF. Let CM be added to each; therefore the whole AM is equal to the gnomon NOP. But AM is the rectangle AD, DB, for DM is equal to DB; therefore the gnomon NOP is also equal to the rectangle AD, DB. Let LG, which is equal to the square on BC, be added to each; therefore the rectangle contained by AD, DB together with the square on CB is equal to the square on CD. Let AB be the given straight line; thus it is required to cut AB so that the rectangle contained by the whole and one of the segments is equal to the square on the remaining segment. For let the square ABDC be described on AB; let AC be bisected at the point E, and let BE be joined; let CA be drawn through to F, and let EF be made equal to BE; let the square FH be described on AF, and let GH be drawn through to K.
I say that AB has been cut at H so as to make the rectangle contained by AB, BH equal to the square on AH. For, since the straight line AC has been bisected at E, and FA is added to it, the rectangle contained by CF, FA together with the square on AE is equal to the square on EF. [Bk II. Prop 6] But EF is equal to EB; therefore the rectangle CF, FA together with the square on AE is equal to the square on EB. But the squares on BA, AE are equal to the square on EB, for the angle at A is right [Bk I. Prop 47, Pythagorean theorem]; therefore the rectangle CF, FA together with the square on AE is equal to the squares on BA, AE. Let the square on AE be subtracted from each; therefore the rectangle CF, FA which remains is equal to the square on AB. Now the rectangle CF, FA is FK, for AF is equal to FG; and the square on AB is AD; therefore FK is equal to AD. Let AK be subtracted from each; therefore FH which remains is equal to HD. And HD is the rectangle AB, BH for AB is equal to BD; and FH is the square on AH; therefore the rectangle contained by AB, BH is equal to the square on HA. therefore the given straight line AB has been cut at H so as to make the rectangle contained by AB, BH equal to the square on HA. Magnitudes are said to be in the same ratio, the first to the second and the third to the fourth, when, if any equimultiples whatever be taken of the first and third, and any equimultiples whatever of the second and fourth, the former equimultiples alike exceed, are alike equal to, or alike fall short of, the latter equimultiples respectively taken in corresponding order. Book V, Definition 5 (credited to Eudoxus of Cnidus). Two unequal magnitudes being set out, if from the greater there be subtracted a magnitude greater than its half, and from that which is left a magnitude greater than its half, and if this process be repeated continually, there will be left some magnitude which will be less than the lesser magnitude set out. Had the early Greek mind been sympathetic to the algebra and arithmetic of the Babylonians, it would have found plenty to exercise its logical acumen, and might easily have produced a masterpiece of the deductive reasoning it worshipped logically sounder than Euclid's greatly overrated Elements. The hypotheses of elementary algebra are fewer and simpler than those of synthetic geometry. ...they could have developed it with any degree of logical rigor they desired. Had they done so, Apollonius would have been Descartes, and Archimedes, Newton. As it was, the very perfection... of Greek geometry retarded progress for centuries. Out of the pictures which are all that we can really see, we imagine a world of solid things; and... this world is constructed so as to fullfil a certain code of rules, some called axioms, and some called definitions, and some called postulates, and some assumed in the course of demonstration, but all laid down in one form or another in Euclid’s Elements of Geometry. ...This book has been for nearly twenty-two centuries the encouragement and guide of that scientific thought which is one... with the progress of man from a worse to a better state. The encouragement; for it contained a body of knowledge that was really known and could be relied on, and that moreover was growing in extent and application. For even at the time this book was written—shortly after the foundation of the Alexandrian Museum—Mathematic was no longer the merely ideal science of the Platonic school, but had started on her career of conquest over the whole world of Phenomena. The guide; for the aim of every scientific student of every subject was to bring his knowledge of that subject into a form as perfect as that which geometry had attained. Far up on the great mountain of Truth, which all the sciences hope to scale, the foremost of that sacred sisterhood was seen, beckoning for the rest to follow her. And hence she was called, in the dialect of the Pythagoreans, “the purifier of the reasonable soul.” Being thus in itself at once the inspiration and the aspiration of scientific thought, this book of Euclid has had a history as chequered as that of human progress itself. William Kingdon Clifford, Lectures and Essays (London, 1886) 2nd edition, pp. 210-211. What Proclus means...is... An area is applied to a given line segment, if we construct thereon a parallelogram of the given area and having a given angle. If the side of the parallelogram include not only the segment, but a prolongation, that part which is built on the extension is called the excess. On the other hand, if we use but a part of the segment, the parallelogram of the same height built on the unused part is called the defect. , and complete the gnomon. The existence of incommensurable geometric magnitudes... necessitated a thorough reexamination and recasting of the foundations of mathematics, a task that occupied much of the fourth century B.C. During this period Greek algebra and geometry assumed the highly organized and rigorously deductive form that is set forth the the 13 books of the Elements that Euclid wrote about in 300 B.C. This systematic exposition of the Greek mathematical accomplishments of the preceding three centuries is the earliest major Greek mathematical text that is now available...(due perhaps to the extent to which the Elements subsumed previous expositions). has been applied to the given segment AB. I want now to glance for a moment at the development of the theoretical method, and while doing so especially to observe the relation of pure theory to the totality of the data of experience. Here is the eternal antithesis of the two inseparable constituents of human knowledge, Experience and Reason, within the sphere of physics. We honour ancient Greece as the cradle of western science. She for the first time created the intellectual miracle of a logical system, the assertions of which followed one from another with such rigor that not one of the demonstrated propositions admitted of the slightest doubt—Euclid's geometry]]. This marvellous accomplishment of reason gave to the human spirit the confidence it needed for its future achievements. ...But yet the time was not ripe for a science that could comprehend reality, was not ripe until a second elementary truth had been realized, which only became the common property of philosophers after Kepler and Galileo. Pure logical thinking can give us no knowledge whatsoever of the world of experience; all knowledge about reality begins with experience and terminates in it. In England the geometry studied is that of Euclid, and I hope it never will be any other; for this reason, that so much has been written on Euclid, and all the difficulties of geometry have so uniformly been considered with reference to the form in which they appear in Euclid, that the study of that author is a better key to a great quantity of useful reading than any other. No one has ever given so easy and natural a chain of geometrical consequences [as Euclid]. There is a never-erring truth in the results. Augustus De Morgan in: Smith’s Dictionary of Greek and Roman Biology and Mythology, (London, 1902), Article, “Eucleides.” Reported in Moritz (1914): About the translations of Euclid’s Elements. If we consider him [Euclid] as meaning to be what his commentators have taken him to be, a model of the most unscrupulous formal rigour, we can deny that he has altogether succeeded, though we admit that he made the nearest approach. The “elements” of the Great Alexandrian remain for all time the first, and one may venture to assert, the only perfect model of logical exactness of principles, and of rigorous development of theorems. If one would see how a science can be constructed and developed to its minutest details from a very small number of intuitively perceived axioms, postulates, and plain definitions, by means of rigorous, one would almost say chaste, syllogism, which nowhere makes use of surreptitious or foreign aids, if one would see how a science may thus be constructed one must turn to the elements of Euclid. As to the need of improvement there can be no question whilst the reign of Euclid continues. My own idea of a useful course is to begin with arithmetic, and then not Euclid but algebra. Next, not Euclid, but practical geometry, solid as well as plane; not demonstration, but to make acquaintance. Then not Euclid, but elementary vectors, conjoined with algebra, and applied to geometry. Addition first; then the scalar product. Elementary calculus should go on simultaneously, and come into the vector algebraic geometry after a bit. Euclid might be an extra course for learned men, like Homer. But Euclid for children is barbarous. It is certain that from its completeness, uniformity and faultlessness, from its arrangement and progressive character, and from the universal adoption of the completest and best line of argument, Euclid’s “Elements” stand pre-eminently at the head of all human productions. In no science, in no department of knowledge, has anything appeared like this work: for upward of 2000 years it has commanded the admiration of mankind, and that period has suggested little toward its improvement. The Elements of Euclid is as small a part of mathematics as the Iliad is of literature; or as the sculpture of Phidias is of the world’s total art. Let us for the present admit, that a new work were written on a plan different from that of Euclid, constructed upon different principles, built upon different data, and exhibiting the leading results of geometrical science of a different order. Let us wave also the great improbability, that even an experienced instructor should execute a work superior to that which has been stamped with the approbation of ages, and consecrated, as it were, by the collected suffrage of the whole civilised globe. Still it may be questioned whether, on the whole, any real advantage would be gained. It is certain that all would not agree in their decision on the merits of such a work. Euclid once superseded, every teacher would esteem his own work the best, and every school would have its own class book. All that rigour and exactitude, which have so long excited the admiration of men of science, would be at an end. These very words would lose all definite meaning. Every school would have a different standard; matter of assumption in one, being matter of demonstration in others; until, at length, Geometry, in the ancient sense of the word, would be altogether frittered away, or be only considered as a particular application of Arithmetic and Algebra. Dionysius Lardner, The First Six Books of the Elements of Euclid (1846) Preface, p. xi. Abraham now thinks that the aggregate of all his schooling did not amount to one year. He was never in a college or academy as a student, and never inside of a college or academy building till since he had a law license. What he has in the way of education he has picked up. After he was twenty-three and had separated from his father, he studied English grammar—imperfectly of course, but so as to speak and write as well as he now does. He studied and nearly mastered the six books of Euclid since he was a member of Congress. He regrets his want of education, and does what he can to supply the want. In his tenth year he was kicked by a horse, and apparently killed for a time. Abraham Lincoln, "A Short Autobiography..." (June, 1860) The Autobiography of Abraham Lincoln (1905) pp. 9-10. Newton had so remarkable a talent for mathematics that Euclid’s Geometry seemed to him “a trifling book,” and he wondered that any man should have taken the trouble to demonstrate propositions, the truth of which was so obvious to him at the first glance. But, on attempting to read the more abstruse geometry of Descartes, without having mastered the elements of the science, he was baffled, and was glad to come back again to his Euclid. To solve [Book I] Prop. XI algebraically, or to find the point H in AB such that the rectangle contained by the whole line AB and the part HB shall be equal to the square of the other part AH. It may be observed that the parts AH and HB cannot be numerically expressed by any rational number. Approximation to their true values in terms of AB, may be made to any required degree of accuracy, by extending the extraction of the square root of 5 to any number of decimals. Robert Potts, Notes to Book I (1845) Euclid's Elements of Geometry: Chiefly from the Text of Dr. Simson, with Explanatory Notes, p. 72. The property of similar triangles, and that contained in Prop. 47, Book I [the Pythagorean theorem], are most important theorems in Geometry. Robert Potts, Notes to Book VI (1845) Euclid's Elements of Geometry: Chiefly from the Text of Dr. Simson, with Explanatory Notes. Now in the discovery of lemmas the best aid is a mental aptitude for it. For we may see many who are quick at solutions and yet do not work by method; thus Cratistus in our time was able to obtain the required result from first principles, and those the fewest possible, but it was his natural gift which helped him to the discovery. Proclus (c.460 AD) as quoted by Thomas Little Heath, The Thirteen Books of Euclid's Elements (1908) Vol. 1, p. 133. Euclid is a Platonist by persuasion and intimate with this system of philosophy, and so he has set before himself as goal of his system of Elements the constitution of the Platonic figures, as they are called. Proclus (c.460 AD) Prologue, part 2, in Euclid, Proclus, Introduction, The First Book of Euclid's Elements: With a Commentary Based Principally Upon that of Proclus Diadochus (1905) Tr. William Barrett Frankland, p. xiv. Euclid's Elements is certainly one of the greatest books ever written, and one of the most perfect monuments of the Greek intellect. Upon these accounts it appeared necessary and I hope will prove acceptable to all lovers of accurate reasoning and of mathematical learning to remove such blemishes and restore the the principal Books of the Elements to their original accuracy, as far as I was able; especially since these Elements are the foundation of a science by which the investigation and discovery of very useful truths, at least in mathematical learning, is promoted as far as the limited powers of the mind allow; and which likewise is of the greatest use in the arts both of peace and war, to many of which geometry is absolutely necessary. This I have endeavoured to do, by taking away the inaccurate and false reasonings which unskilful editors have put into the place of some of the genuine Demonstrations of Euclid, who has ever been justly celebrated as the most accurate of geometers, and by restoring to him those things which Theon or others have suppressed, and which have these many ages been buried in oblivion. Geometry is nothing if it be not rigorous, and the whole educational value of the study is lost, if strictness of demonstration be trifled with. The methods of Euclid are, by almost universal consent, unexceptionable in point of rigour. The doctrine of proportion, as laid down in the fifth book of Euclid, is, probably, still unsurpassed as a masterpiece of exact reasoning; although the cumbrousness of the forms of expression which were adopted in the old geometry has led to the total exclusion of this part of the elements from the ordinary course of geometrical education. A zealous defender of Euclid might add with truth that the gap thus created in the elementary teaching of mathematics has never been adequately supplied. In Euclid's Elements we meet the concept which later plays a significant role in the development of science. The concept is called the "division of a line in extreme and mean ratio" (DEMR). ...the concept occurs in two forms. The first is formulated in Proposition 11 of Book II. ...why did Euclid introduce different forms... which we can find in Books II, VI and XIII? ...Only three types of regular polygons can be faces of the Platonic solids: the equilateral triangle... the square... and the regular pentagon. In order to construct the Platonic solids... we must build the two-dimensional faces... It is for this purpose that Euclid introduced the golden ratio... (Proposition II.11)... By using the "golden" isosceles triangle...we can construct the regular pentagon... Then only one step remains to construct the dodecahedron... which for Plato is one of the most important regular polyhedra symbolizing the universal harmony in his cosmology. [E]arly analytic geometers—Descartes in particular—did not accept that geometry could be based on numbers or algebra. Perhaps the first to take the idea of arithmetizing geometry seriously was Wallis... [(1657) Mathesis universalis. Opera 1, 11-228.] Chs. XXIII and XXV, gave the first arithmetic treatment of Euclid's Books II and V, and he had earlier given purely algebraic treatment of conic sections [(1655) De sectionibus conicus. Opera 1, 291-364.]. He initially derived equations from classical definitions by sections of the cone but then proceeded to derive their properties from the equations, "without the embranglings of the cone," as he put it. It is enough we have the Work. A Work! whose Propositions have such an admirable Connexion and Dependence, that take away but one, and the whole falls; whose Method is the most just, admitting nothing without a Demonstration, and no Demonstration but from what foregoes; and these so convincing, elegant and perspicuous, that it is beyond the Skill of Man to contrive better. Here the most potent and diligent Carpers have never been able to set Footing: This is the happy Empire wherein Truth has had an uninterrupted Reign for upward of 2000 Years, in profound Peace: No Disturbance at all. 'Tis from hence the Heroes of the geometrical World receive Force to vanquish the obstinate and ignorant, and extend their Dominions. The early study of Euclid made me a hater of geometry, … and yet, in spite of this repugnance, which had become a second nature in me, whenever I went far enough into any mathematical question, I found I touched, at last, a geometrical bottom. On being appointed principal mathematical lecturer... and as Euclid seemed to be one of the less popular subjects I undertook it myself. ...I can distinctly affirm that the cases of hopeless failure in Euclid were very few; and the advantages derived from the study, even by men of feeble ability, were most decided. In comparing the performance in Euclid with that in Arithmetic and Algebra there could be no doubt that Euclid had made the deepest and most beneficial impression: in fact it might be asserted that this constituted by far the most valuable part of the whole training to which such persons were subjected. Even the modes of expression in Euclid, which have been theoretically condemned as long and wearisome, seemed to be in practice well adapted to the position of beginners. Isaac Todhunter, Essay on Elementary Geometry; Conflict of Studies and other Essays (London, 1873), p. 167. All such reasonings [natural philosophy, chemistry, agriculture, political economy, etc.] are, in comparison with mathematics, very complex; requiring so much more than that does, beyond the process of merely deducing the conclusion logically from the premises: so that it is no wonder that the longest mathematical demonstration should be much more easily constructed and understood, than a much shorter train of just reasoning concerning real facts. The former has been aptly compared to a long and steep, but even and regular, flight of steps, which tries the breath, and the strength, and the perseverance only; while the latter resembles a short, but rugged and uneven, ascent up a precipice, which requires a quick eye, agile limbs, and a firm step; and in which we have to tread now on this side, now on that—ever considering as we proceed, whether this or that projection will afford room for our foot, or whether some loose stone may not slide from under us. There are probably as many steps of pure reasoning in one of the longer of Euclid’s demonstrations, as in the whole of an argumentative treatise on some other subject, occupying perhaps a considerable volume. To seek for proof of geometrical propositions by an appeal to observation proves nothing in reality, except that the person who has recourse to such grounds has no due apprehension of the nature of geometrical demonstration. We have heard of persons who convince themselves by measurement that the geometrical rule respecting the squares on the sides of a right-angles triangle was true: but these were persons whose minds had been engrossed by practical habits, and in whom speculative development of the idea of space had been stifled by other employments. In the decades leading up to the period of relativity theory the architecture of space was revolutionized. Until then the mathematical imagination, and with it all of scientific thinking, had been dominated by a single book. ...Yet the mathematical framework the Elements espoused grants an unfounded privilege to one view, excluding the very idea of non-Euclidean geometries. The roots of a more flexible attitude to geometry reach back to the Renaissance creators of linear perspective, but the development... into the modern discipline... had to await the... great mathematicians such as Poncelet, Cayley and Klein. By the time of Einstein, non-Euclidean geometries and the even more comprehensive theory of projective geometry had broken the grip of Euclid on mathematical and spatial thinking, and a new imagination of space could be born.